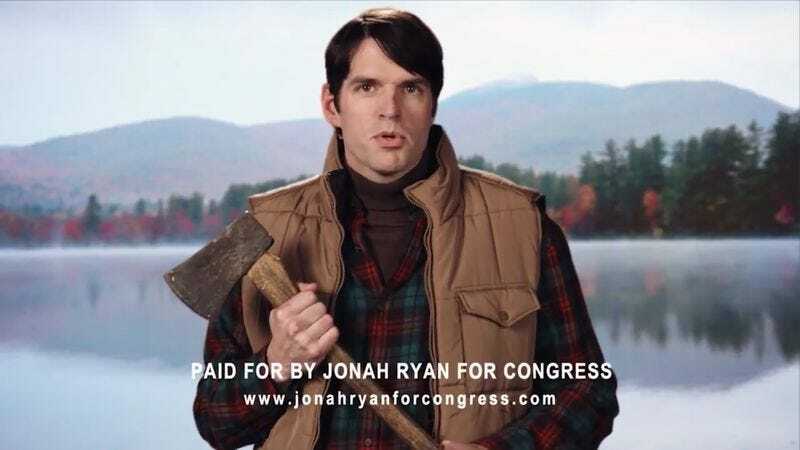 The verisimilitude of the fictional Ryan campaign extends to a series of ridiculous ads, each one trying to present the unlikable, duplicitous candidate as a folksy, L.L. Bean-clad man of the people, the kind of guy who likes chopping wood and chasing children around playgrounds on crisp autumn days. Each spot is a mini-masterpiece of insincerity and awkwardness. Ryan emerges as a man who is not only shallow but, paradoxically, profoundly shallow. Here he is, talking about the importance of children, à la “The Greatest Love Of All”: “Even though I don’t have any children yet, I plan on having some in the future, and that’s why I’m running for Congress today.” So it’s for the children, see. What’s truly disquieting about the website is that it’s completely passable. Ryan offers nothing but clichés, empty promises, and corny platitudes with no genuine or honest thought behind them. Yet, his site is polished and presentable enough to get him elected to office.